Geometrical Parallax 1838 a logical fallacy ….. The definition of parallax is : the position shift of 2 objects relative to a third object, assumed fixed. The MS version of an HC system is shown at top, where E is the Earth, N a near star and F a far star. 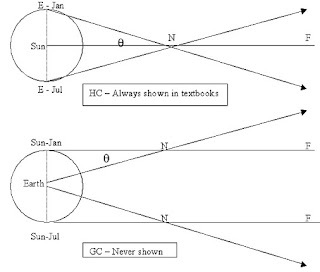 The Sun and stars are considered fixed and the reference is the S-N-F line of sight. The exact same geometry and angle of parallax is found in the GC model at bottom, using the same S-N-F reference line. So the HC and GC systems predict the same results…. How then is this equivalence twisted to require the HC view? 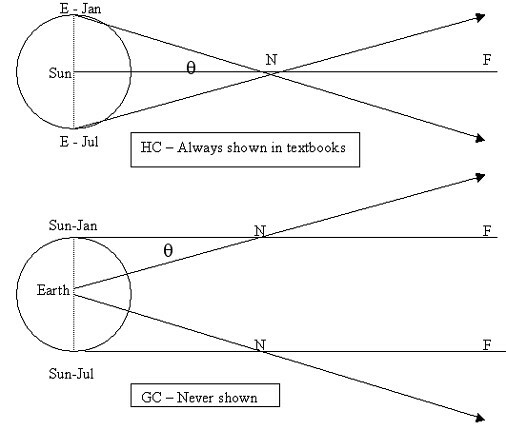 The parallax definition needs to have one object fixed … the HC version fixes the Sun and the 2 stars, and then claims this proves the Earth moves…. The Earth is the only object that CAN MOVE with this HC assumption! If the Earth didn’t move in this version, then NOTHING would move in the heavens …. This is a classic fallacy of circular reasoning , a mainstream favorite. Another MS version uses Ptolemy’s model for GC, which was reject by Tycho Brahe four centuries ago. Using the Ptolemaic instead of the neo-Tychonian model is a strawman or red herring fallacy, attributing to modern geocentric believers what was refuted long ago. The neoTychonian model has the stars orbiting the Sun in elliptic paths, which explains the parallax as due to the varying speeds of the stars as seen from cosmic distances. Conclusion: The argument against GC using parallax is false logic – the fallacy of circular reasoning. The neo-Tychonian model – having elliptic solar and stellar orbits around Earth – accounts for observed parallax between near and remote stars.